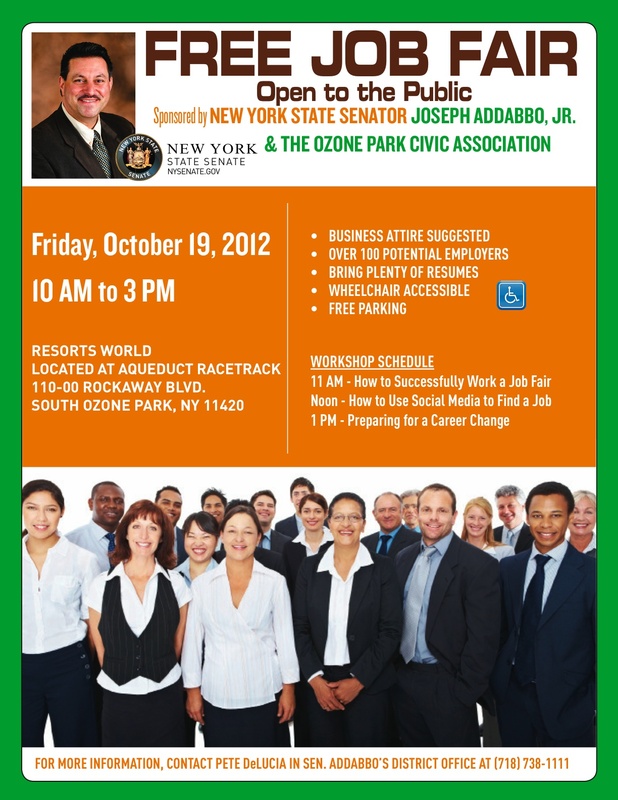 Home > Events	> FREE Job Fair 10/19! FREE JOB FAIR! OPEN TO THE PUBLIC! From the Van Wyck: Exit 1W to North Conduit Avenue. Follow signs to Aqueduct Racetrack on right. From the Belt Parkway: Eastbound Exit 19. Westbound Exit 18-B (Lefferts Blvd.) Then, follow signs to Aqueduct Racetrack on right. (or the RFK bridge to the Grand Central Parkway) to the Van Wyck Expressway South. Then take exit 1W to North Conduit Avenue and follow signs to Aqueduct Racetrack on right. Hey Kamimie is it still time to help with the vote here? Or do I have to live in Montreal?? You can still help with voting. People can register to vote by clicking on the ‘Register to Vote’ image on the top right.